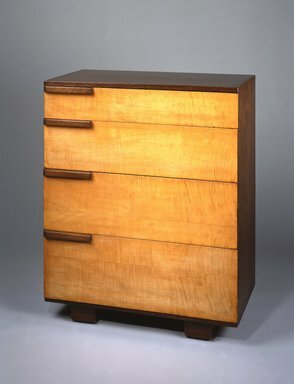 Rectangular chest of four drawers made of English sycamore and sucupiro over plywood. Body of chest made of darker wood and raised on two rectangular block feet set in from sides and spanning depth of chest. Four flat-faced drawers with no spacing between them increase in height from top to bottom; faced with lighter wood; side edge of drawers flush with side of chest. Rounded rectangular handle of darker wood applied to proper right top corner of each drawer. From bedroom group 2185. En suite with vanity 85.159.1. CONDITION: All exterior surfaces heavily cleaned (probably with fine steel wool (?). All corners where drawers meet chest frame painted with hard-drying substance to ease movement. Overall wear due to use. Proper right edge of drawer third from the top has chipped veneer. Minor nicks to handles. On back side, three wear marks near lower edge.